Early 20th century photographic images from the Woman’s College of Due West (SC), including class pictures. 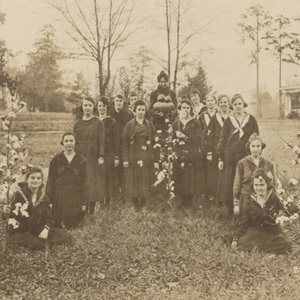 In 1904, the Due West Female College (founded in 1859) came under the control of the Synod of the Associate Reformed Presbyterian Church, and the school’s name was changed to the Woman’s College of Due West. There was the same mission to provide young women with equal educational opportunity as young men. The Woman’s College co-existed alongside the all-male Erskine College from1904 until 1927, when the two institutions merged to become Erskine College.